Next Nomad unit tier coming in v2.39. 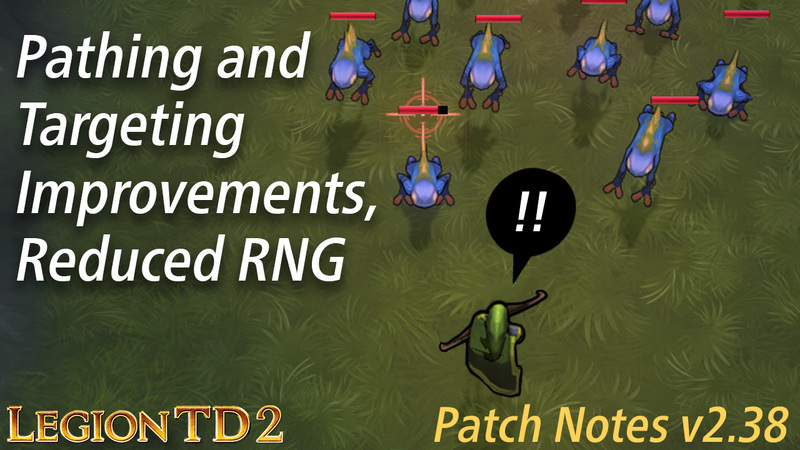 For this patch, we’re focusing on extensive gameplay improvements and reduction of RNG in the game. You are no longer auto-booted for idling for 30 minutes in the lobby. Feel free to leave Legion TD 2 minimized when you’re not playing, which actually helps to increase the sociability and network effects of the game. Legion TD 2 has players from 100 countries/territories! Example: If your Antler first attacked (engaged) the Granddaddy before the Berserker, the Granddaddy should always target the Antler before the Berserker. We’re being intentionally conservative with balance because we’ve only had 4.5 days since the last patch. That’s hardly enough time to make big balance changes. We were tempted to include no balance changes this patch but figured a few tweaks was better than nothing. Pyro is a weak unit, but we have to nerf it further because Mech is too strong. This is a temporary solution. We’re working on a “fix” to Mech that allows us to buff Pyro and Tempest without making Mech OP. It’s technically complex to make Leviathan affect Undead Dragons but not Lord of Death. We plan to implement this in a future patch, but in the meantime, Aerial Command can only affect both or neither. It now affects both.